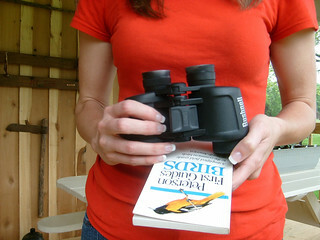 My Mom found my old bird book... the one I'm holding. It still has the library card in the back where my friend Mandy and I played library when we were kids. It's better than the other one I have. I've been enjoying all the birds lately. I've seen an indigo bunting for the first time and an eastern kingbird. It's so neat to me.